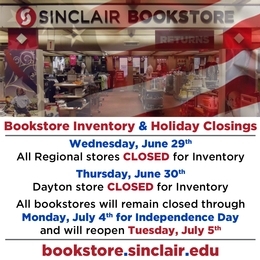 Sinclair bookstores will be closed on the following days for inventory and the Independence Day holiday. Wed., June 29 - Fri., July 1: REGIONAL stores CLOSED for inventory. Thurs., June 30 - Fri., July 1: DAYTON store CLOSED for inventory. Monday, July 4: ALL stores CLOSED for Independence Day hoilday. Regular hours resume on Tuesday, July 5.